What do you do when you're a band that can bring a party to any stage you touch? You bring the party to your album by inviting several of your friends - musicians with a well-established name - to play on your record. Waylon Jennings, Taj Mahal, John Popper Lucinda Williams, Earl Scruggs, and Bela Fleck, not to mention several others of equal stature, make guest appearances throughout this country-tingled bluegrass album with Cajun and blues flavors to boot. From the moment the bluegrass stomp of "Midnight Blues" hits, you'll instantly be thrust into action as the sting of the banjo and the fresh-air sweep of the percussion hit you and quickly get you dancing. Then the tender "Lovin' In My Baby's Eyes," with Taj Mahal on lead vocals, brings forth the country sweetness that will have you feel the emotions and indulging in the power that comes across on this number. Of course, don't pass up the Cajun dance of "Dance On Your Head." The spicy Latin beats hits New Orleans Cajun rhythms as the music overpowers you and sets you free to dance "on your head". But the album is so much more than that, as the bluegrass warmth of "Five Alive" and the country/pop-rock of "Lines Around Your Eyes," which finds Lucinda Williams on lead, will attest too. "On The Other Side," a romping country-stomper and "Nobody's Fault But Mine" a blues number, also attest to the diversity and strength of this album. 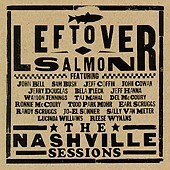 With the guest list extending into the who's who of several different genres, and being a strong, competent band themselves, Leftover Salmon have unleashed a strong album that will have you partying, dancing, and grooving all night long. I'll give it an A.